This image was scanned from the publication - How Firm a Foundation: A History of the Township of Cramahe and the Village of Colborne in Cramahe's Digital Archives (3bk), p.40. 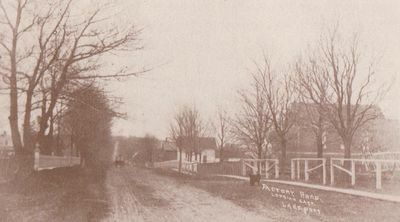 The caption reads: "Lakeport Road, formerly known as Factory Road, looking east. The cemetery is on the left, St. Paul's Presbyterian Church on the right." Text on postcard: Lakeport Road, looking east, Lakeport.